A superb hydrator for any skin type. Mystique Fountain tones and calms, cools and refreshes your skin, naturally protecting it from environmental damage as it reduces inflammation. Based on our Pure Pacific Ocean Rainwater (clean, soft water gathered before ever touching the earth, naturally free of harsh chemicals or contaminants) Mystique Fountain actually aids your skin in drawing moisture from the air. This also allows it to be absorbed faster and, most importantly, helps your skin retain the moisture it has. LUXTURAL® Special Exotic Extract is a one of a kind complex that adds additional moisturizing and antioxidant properties. This product is naturally preserved. We recommend that you apply it to a clean face as a primer/ enhancer to Luxtural’s other products, or use it separately. 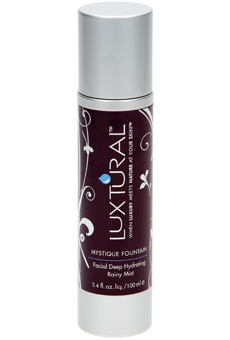 Mystique Fountain can be used directly over make-up without fear of “messing things up”. Spray on clean face, with eyes closed, holding the container at arm’s length from your face. Breathe deeply and enjoy the natural smell. Tap face lightly with clean fingers and experience a cooling, tingling sensation. For best results, after applying Mystique Fountain, follow with the application of LUXTURAL® moisturizer “SILK PREMONITION” and then LUXTURAL® serum “SOPHISTICATED VEIL”.